Learn how to start a podcast with my step-by-step podcasting tutorial. I'll teach you how to record, edit, and upload, along with all the tools you need to start. Starting a podcast has been one of the best decisions I have ever made. (I'll tell you why in a little bit.) In this complete tutorial, you're going to learn, step-by-step, how to start a podcast. Thank you to the thousands of people who have emailed me and also those who have let me know in person that this is the very tutorial that helped you get started. That's why I do what I do, so let's get right to it! Choose a topic you can commit to. Define your show description and artwork. Set up and thoroughly test your equipment. Create a plan for your episodes. Launch your podcast to your audience. That’s the 30,000 foot view of starting a podcast—the rest of this tutorial will go into extensive detail on each of these steps. My goal is to make sure that you understand both what to do and why you’re doing it. In the first three sections, What Podcasting Has Done for My Business, My #1 Lesson Learned from Starting a Podcast, and You’re Ready to Get Started, I’ll share with you my experience with starting a podcast and lay out the business case for why podcasting is worth your time. In the following sections, The One Thing You Must Do Before You Start, How Podcasting Actually Works, and Five Things You Should Prepare Before You Begin Recording, I’ll help you prepare for starting your podcast, taking you through the first two steps in the high-level list above. You’ll learn what you need to be successful, how podcasting works, and how to start planning your podcast. And finally, we arrive at my favorite section, the Tutorial Videos! I’ll teach you how to set up your equipment and how to record, edit, and publish your show. By the end of these videos, you’ll know everything you need for starting your podcast. How is this different from Power-Up Podcasting? Before I start the free tutorial, I want to explain the difference between this and my paid course, Power-Up Podcasting®. This free tutorial is an in-depth walkthrough of how to start a podcast from the technical standpoint. It teaches you how to set up a microphone, record, edit, and publish your podcast. It has helped thousands of podcasters start their podcasts and I’m really proud of it. Power-Up Podcasting will teach you all of this content, but it also goes into great detail about the marketing of your podcast, including how to create a launch week marketing plan, how to grow your audience, and—once you have an audience—how to monetize your podcast. The other way that Power-Up Podcasting differs from this in-depth free tutorial is that it includes access to a closed Facebook community, where you can find support and bounce ideas off of other students, as well as have the opportunity to participate in office hours with me. If you’re looking for detailed advice on podcast marketing, and/or if you really crave a collaborative community, then my paid course, Power-Up Podcasting, will be a good fit for you. Now that you know the difference between the two, let’s dive in to the free tutorial and learn how to start a podcast! The show has surpassed 48,000,000 total downloads (as of May 2017). The podcast has become the #1 way people who read my blog find out about me—that’s above search, social media, and links from other websites (See survey results). I was contacted by a Hollywood producer who listened to my show to consult as the social media director for a $10M independent film (See IMDb). Book publishers have reached out to me and asked if I was interested in working with them for upcoming publications. Fox News reached out to me to feature my story on the evening news. Several other big-name bloggers have started their podcasts, including Michael Hyatt, Michael Stelzner, Derek Halpern, and Seth Godin. I won an award for Top Business Podcast 2015 at Podcast Movement. I’ve also since started a few other podcasts, like AskPat, FoodTruckr School, and The 1-Day Business Breakthrough Podcast with co-host, Chris Ducker. The Smart Passive Income Podcast has been instrumental to my success—so I decided to create more! And guess what? These shows help grow my audience even more! A weekly coaching call on online business, blogging, marketing, and lifestyle design. No one has a monopoly on good ideas. Discover yours today. It's Hard to Get Started. This Tutorial Will Help. I first announced my interest in starting a podcast back in December 2008. And yet, I didn’t publish my first podcast episode until July 2010—a full year and a half later! At first, I was bad at podcasting. I was confused about how to structure a show and navigate a listener through it. I wasn’t sure what gear I should use to record and produce my show. But most of all, I wasn’t confident on the mic, and it showed. Listen for yourself using the player below. It’s the first short test recording I did as a part of my announcement post in 2008. Listening to it now, I cringe. Personally, I find it very hard to listen to. But you know what—it shows just how much I’ve improved my skills. And that’s the point—you just have to get started! I also dawdled on launching the Smart Passive Income Podcast because setting it up was a lot harder than I expected. Podcasting was brand new to me, relatively technical, and I just didn’t know where to begin. After trying to figure it out on my own, I gave up and put the project aside until I finally asked for help from two dear friends of mine: Jason Van Orden from Internet Business Mastery and Cliff Ravenscraft from Podcast Answer Man. Both Jason and Cliff inspired and personally helped me set up my podcast. Thank you both if you’re reading this! Since I became interested in podcasting, a lot of great “how to podcast” tutorials have popped up on the internet. I wish these had been around when I first started! If you find receiving daily reminders helpful, you can sign up to get the information in this tutorial as a free 3-day mini-class, How To Start a Podcast at HowToStartaPodcast.com! The tutorial that you’re reading today was not created to outdo any of the other podcasting tutorials out there. I created mine because I know I have a particular style of teaching that resonates with a lot of my audience. And so, without further ado, here is my version of how to start a podcast. I hope you enjoy. You must internally commit to podcasting, as you have to do with anything that is potentially beneficial but takes some time and effort. It’s easy to get excited about the potential of podcasting and what it can do for you and your brand. The possibilities are endless, but only if you keep at it. My best advice is to enjoy every single part of it. Once you start thinking, “Ugh, I have to record another episode soon,” that’s when you should remember why you started podcasting in the first place. Results take time, so you might as well enjoy it. Before I get into the step-by-step videos, I wanted to give you the roadmap so you know where we’re headed. Setting up a podcast is not push-button easy, but it’s not rocket science either, and once you set things up the first time you’ll have done most of the work. Then, all you have to worry about is producing more audio content and posting it to your blog. Everything else happens automatically. Each particular episode of your podcast show is an individual audio file, typically an MP3 file, since this format is the best balance between sound quality and file size. We’ll talk more about recording equipment and which elements to include in your show later in this tutorial. For the purposes of this example, let’s say that you record your first episode and export the recording as SPI001.mp3, which is now on your desktop. Before you upload this file anywhere, you need to provide some more information about this specific piece of audio. This is what is called “tagging the file,” or in technical terms, editing the metadata or ID3 tags. You need to include this additional data along with your audio file so that media players can understand and display things like the title of the podcast, your name, the episode number, and even the artwork for your podcast. I won’t get into too much detail here in the roadmap, but when I talk about each of these parts individually I’ll give you all of the tools and resources you need. After you have your audio properly tagged, you must upload and store SPI001.mp3 onto a server somewhere so that whenever a media player wants to play it (from a website, from iTunes, from a mobile device, etc. ), it knows where to call that audio file from for streaming or downloading. You could store your audio files on your own website’s server, but I do not recommend that because you could easily run into bandwidth issues and your site could slow down or even crash as a result. If you upload your audio onto a separate server dedicated solely to your podcast media, you run no risk of overloading your own site and you’ll be able to provide a better experience for your audience too, because the audio will stream much faster. This link is important because, as I said earlier, this is the link that media players and directories like iTunes use to play your podcast episode. But here’s where it gets a little tricky. Now we’ll talk about feeds, which is a technical term that always seems to confuse people, including myself at times. A feed is a standardized way to syndicate written content so that it is more easily read by other websites, applications, and directories. The specific technical format of a feed makes it so that you, the end user, can read data in a way that is more pleasing and easy to read. A blog is a specific type of feed, so if your website is on a blogging platform like WordPress, you’re already set up with a feed. People who are subscribed to your feed will automatically get your new content whenever you publish that new content on your site. So how do feeds relate to podcasting? Podcast directories such as iTunes, Stitcher, Google Play, and others read your feed, scanning it for properly tagged MP3 files. That’s how they know a new show came out, because it’s shown in your feed. Unlike what I had originally thought, you submit your feed address to podcasting directories like iTunes—you don’t upload each individual episode to them. This is why after the initial setup, all you have to do is keep publishing audio content on your website and iTunes, and other directories will automatically get updated when new episodes come out. Don’t worry if all of this sounds a little too technical right now—trust me, I understand. The rest of this tutorial will make it much easier for you than it was for me when I first started. Before you start recording, and even before you dive into the tutorial videos below, there are five things you need to prepare. Have all of this stuff handy for later—you’ll thank me for it. You’re going to need a title for your show. For most of you, the name of your blog, or the name of your brand along with “podcast” will make the most sense, but you also have the opportunity to add a few extra words to target specific keywords that you’d like to rank for in iTunes. iTunes is a search engine—don’t forget that. Don’t go crazy with the keywords, though. Don’t keyword stuff by adding a billion keywords to your title! Try to keep your title as natural as possible, so select your keywords carefully. Open up iTunes and search for “online business” or “blogging.” Scroll down to the Podcasts and Podcasts Episodes sections and you’ll see what I’m talking about. This is, of course, your name—but you can add a little bit more to help your show rank higher for certain keywords in iTunes. Just as with your podcast’s title, don’t go crazy with it. But, at the same time, don’t be afraid to help people (and the iTunes search algorithm) understand who you are. You can also add what you do. 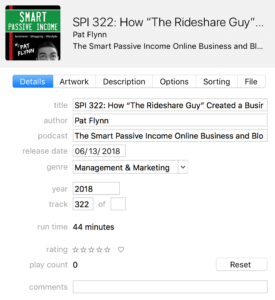 For example: Pat Flynn, Blogging and Podcasting. 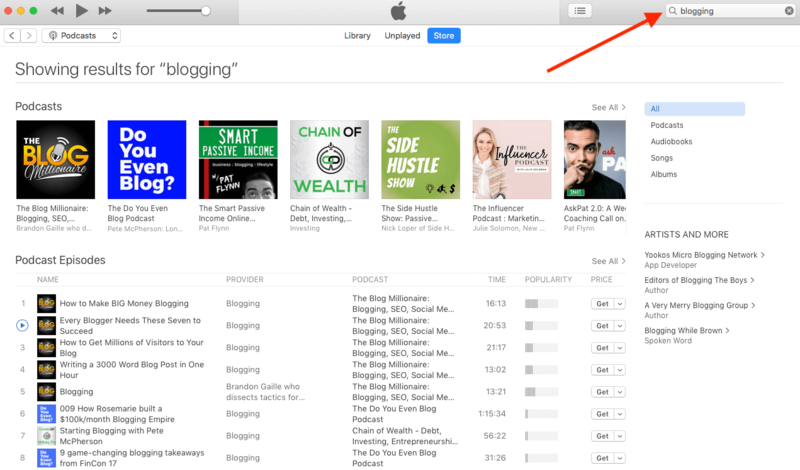 Look up the word “blogging” in iTunes and scroll down to the podcasts section—you’ll see what I’m talking about. iTunes and other directories may ask for a subtitle for your show. iTunes and many other directories don’t actually show the subtitle anywhere. That’s not to say they will never show the subtitle (or don’t use them in search), which is why it’s important to create one anyway. It’s always helpful to have a short, small description for your podcast handy for later. A couple sentences should suffice. This is the main description for your podcast. In iTunes, you can have up to 4,000 characters to describe your show. Your copy should be engaging and descriptive, but also include keywords that you’d like to target in iTunes as well. A great description that relates to your show will naturally include keywords anyway, so keep that in mind. Write your description down and save it for later so you can easily copy and paste it when you need to share a summary of your show. Your podcast is going to need some artwork—a square image that represents your show. As much as podcasting is an auditory medium, the graphical, visual element that represents your podcast plays an extremely important role. For one, it’s what people will see in podcasting directories (such as iTunes) before listening to a single spoken word and before reading any written words about your show in the description or summary. Your artwork is your podcast’s first impression, and it’s also what competes for attention with every other podcast that’s out there. 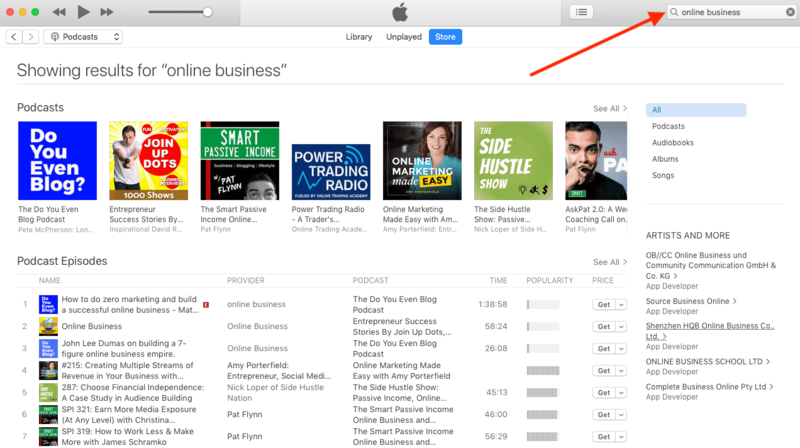 For iTunes specifically, a visually appealing podcast image gives your show a better chance of being featured in highly visible sections of iTunes, such as their “New & Noteworthy” and “What’s Hot” sections for your show’s category. And lastly, your artwork is what people will see on their media players—on their computers and mobile devices—when they listen to your show. It’s an important element for reinforcing your brand identity to your followers. You will need one (1) image that you feel best represents your podcast. Current maximum size is 3000 x 3000 pixel image (minimum size is 1400 x 1400 pixels) at 72 DPI (dots per inch). I recommend using the maximum size, which is indeed quite large, in order to support the high resolution capacity of new media players available on the market (such as Apple’s media player on Retina displays). This image should be in .jpg or .png file format and in the RGB colorspace. Any text should also be readable at a much smaller file size. Many directories and mobile media players will automatically shrink the larger image size to fit smaller containers. Text that is small at 3000 x 3000 will become unreadable when you shrink the logo down to 300 x 300. My recommendation to keep in mind during your logo design process is to optimize your text for a 150 x 150 resolution. If it looks good at that size, it should read perfectly everywhere else. In addition to the one (1) 3000 x 3000 pixel image, you will need the same image with a slightly different file name at 300 x 300 resolution. You’ll use this when uploading your artwork. Once you get these five items in place, you’re ready to go. Now it’s time to get your show up and running on your site. Here’s how to get it done. In this video, I go over some equipment options including microphone and microphone accessories (with audio examples of each), as well as the software you need to record yourself and interviews for your show. There's a lot that goes into recording a high-quality, engaging show. Here are my top podcasting tips for recording, conducting interviews, and exporting your podcast files. Once you finish recording and editing your show, how are you going to submit your podcast to iTunes, Stitcher, Google Play, and other directories? Watch the video to figure out your podcast feed, publish new episodes, and more. This video is for podcasters who wish to use Buzzsprout as their file host. This video is for podcasters who wish to use Libsyn as their file host. If you’ll be connecting a mixer to a MacBook Air or new 27″ Retina Display iMac, you’ll need one more additional item. The Griffin iMic adapter will be the solution to connect the Dual RCA Cable coming from your mixer (red/white on one end, single 1/8″ stereo jack on the other end) into a USB port on your computer. The length of your podcast is up to you, but the key is to remain consistent. You don’t want to fluctuate too much when it comes to your episode length. If your episode is typically around thirty minutes, try to hit that target each time. This will let your listeners know how much time to allot for each episode, which sets the right expectation. I do my best to make the technical stuff as non-technical as possible for you. In this video, I’ll be your trusty guide in the often tricky areas of exporting your audio, submitting your podcast to directories (iTunes, Stitcher, Google Play), uploading your mp3 files to your podcast host, and more. I have two versions of Video 3 for you; this one shows you how to set up Buzzsprout as your file host. Buzzsprout has become my favorite podcast file host because it is very simple to use and their customer service is outstanding. I have two versions of Video 3 for you; this one shows you how to set up Libsyn as your file host. Libsyn is the most popular file host for beginning podcasters; they’ve been around for a long time and you’ll see them mentioned often. Each month I host a free webinar called Podcasting the Smart Way, where I share strategies for creating, promoting, and monetizing a successful podcast. My goal is to help you succeed! The exact strategy I used with my podcast that helped me generate over $150,000 in sales with a recent course launch. Sign up for the next free webinar here! The easiest to use, best-looking podcast plugin ever made. Since publishing this tutorial a few years back, I created an awesome podcast tool for podcasters who want to increase downloads and number of shares for their show, as well as enhance the look of a podcast player on their website. The truth is, nearly 50 percent of my podcast audience still listens here, directly on my blog. Yes, we should all be encouraging our listeners to subscribe on their devices, but there will always be “web listeners.” I wanted to make sure we didn’t forget about them too—because most podcast players do. You can see a live demo of the Smart Podcast Player above, featuring one of my podcasts. Do you see the speed dial next to the play button? That’s my favorite feature of all. It was a direct result of users asking for it. Learn more about the player at SmartPodcastPlayer.com! I truly hope you enjoyed this tutorial. I spent over 50 hours putting this tutorial together for you and I know it’ll help you fast-track your way to a successful podcast. If it has helped you in any way, please do me a favor and let me know in the comments section below, and also share this tutorial using the social media buttons at the bottom of the post. Thank you! Cheers, and I’ll see you and your podcast on iTunes very soon!